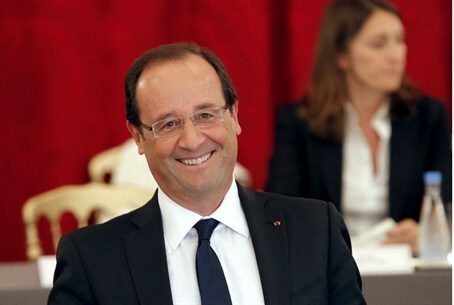 Two-day trip starts Wednesday, will be his first opportunity to talk with President Hollande. Israeli Prime Minister Binyamin Netanyahu will on Wednesday travel to France for talks with President Francois Hollande with the Iranian nuclear threat topping the agenda. Netanyahu will arrive in Paris during the morning and have a working lunch with the French leader. Later in the day, he will also meet with French Prime Minister Jean-Marc Ayrault and Foreign Minister Alain Juppe in what will be his first visit to Paris since Hollande took office in May. The two-day trip is important because it will be Netanyahu's "first opportunity to talk with President Hollande, and he hopes to build a good working relationship with the French leader," a source close to the Israeli leader told AFP. Since taking office five months ago, Hollande has only spoken to Netanyahu by phone, whereas he has already twice met Palestinian Authority chief Mahmud Abbas -- both times in Paris. He has also met Israeli Labor leader MK Shelly Yechimovich, a fellow socialist. The central topic of the leaders' talks is likely to be the international standoff over Iran's nuclear program, Israeli officials said. "France is a very important country in the western alliance which is dealing with the Iranian bomb," a senior official told AFP on condition of anonymity. "Netanyahu clearly wants to talk about the Iranian issue with Francois Hollande, especially after his speech at the UN at the end of September," he said. During that speech at the General Assembly, the Israeli prime minister literally drew a red line for Iran on a bomb diagram to stress his warning about the threat of a nuclear-armed Tehran. Iran denies Israeli and Western views that its nuclear program is a front for a weapons drive, but at the same time declares its intent to destroy Israel. Netanyahu has repeatedly warned that a nuclear Iran would pose an existential threat to the Jewish state and has refused to rule out a pre-emptive strike, fuelling speculation that an attack was imminent. With the rumor mill working overtime, Hollande spoke by phone with Netanyahu in mid-September, urging him to seek a peaceful, diplomatic solution to the Iran standoff. He also stressed France's determination that Iran should suspend its nuclear program and respect UN Security Council resolutions on the issue, officials said. Two weeks later, during his UN address, Netanyahu appeared to pull back from the brink, pushing back the deadline until spring or even summer 2013, ostensibly to allow time for international sanctions to work. A diplomatic adviser at the Elysee Palace confirmed that Iran "would be one of the subjects raised" during Wednesday's talks, without giving any further details. "This working meeting will focus on deepening bilateral ties, on relaunching the peace process and the upheavals in the Arab world," he told AFP. Peace talks with the Palestinian Authority have been on ice for more than two years, but a source close to Netanyahu confirmed the two men would also touch on ways to revive it. "The only real bone of contention between Netanyahu and Hollande is the absence of negotiations with the Palestinians and Israel's continued settlement," said Denis Charbit, professor of political science at Israel's Open University. But he said the issue of peace talks was not likely to play a central role in their talks as a result of the relative calm on the ground. On Thursday, Netanyahu was to travel to Toulouse to attend a memorial ceremony for three children and a French-Israeli teacher at a Jewish school who were murdered by an Islamist terrorist who also killed soldiers of North African origin. "Netanyahu wants to send a message of solidarity with victims of terrorism -- both Jewish and non-Jewish," said an Israel source close to the visit. "He wants to emphasize the importance of unified international action against terrorism."